I will continue the charts with all of the extra units independently as well. The 3 year anniversary has been reached! Since some of the old image links are dying now, here's a celebratory recap post, on page 100. There are more hero units and ships to go. I'm also slowly phasing in 3D models instead of some of the drawings, but the overall project is still just to draw every unit. From now on, I'll be intermittently adding random stray units until LotV comes out, when there'll be another big overhaul. Here's a low-quality preview (outdated now), you can download the full size from my deviantart link above. (Though the full size is a 10MB image, watch out). Below was my original text. 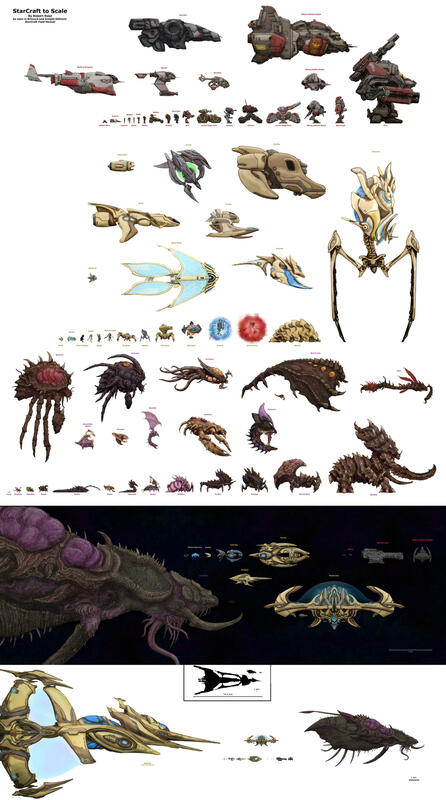 I'm creating a reference of Starcraft units from the side, to scale. The whole thing will be in the format of a large image with all the units lined up to scale, but I'll also create a Flash version where you can zoom in and out. So, I'll be drawing each and every unit in profile for use in this reference. Does anyone have any interest in this project or in which units I should do next? Here was the poster-format image for WoL. I first made this thread on October 9, 2011, and finished the WoL poster on November 9, 2012. Last edited by Robear; 11-29-2015 at 07:00 PM. This is awesome. I'd love to help out in any way. I guess the next units you would do are marine, zealot, and hydralisk. You can get references for those basically anywhere. I also think a zealot suit should augment a protoss' height. Zeratul is pretty short in story mode, but Protoss are supposed to be like 10 ft. tall. Would be a nice way to fix this inconsistency. I definitely agree about Protoss height! I'll be sure to show that when I do the zealot, thanks. For now, here's the hydralisk side view, and a quick mockup of the hydra and zergling vaguely to scale. When I do the final thing I'll cut the units out from the sketchy background rectangles so it'll look nice. Last edited by Robear; 10-09-2011 at 08:54 PM. Hydra looks great. Do you have frontline? The Why We Fight story had some great comparisons, especially zealot vs. ultralisk. If you need any help with that msg me, since I know from doing it myself alot that it can be tedious. Unless you just plan on magic wanding it or something. Last edited by Gradius; 10-09-2011 at 04:04 PM. Wow, thanks for being so helpful. Yeah, help with cutting the units out of their backgrounds would be great, no, unfortunately I don't have Frontline (I was going to go off of Starcraft Ghost for the scales that I could, but that's obviously incomplete), and thanks for that thread, I'm sure it'll be really helpful. Last edited by Robear; 10-09-2011 at 08:52 PM. Cool! Next, how's about mechanized units & starships/zerg fliers? I'd like to help out. There is an old picture from the StarCraft vanilla beta days of a zealot squaring off against a goliath, which seems to scale; and another of a goliath against a grid background, measuring some fifteen squares tall. I'm not sure of they're meters or feet. Yeah, I know the image you're talking about, it's pretty awesome. Both the zealot and the goliath are a bit hunched over, but, based on it, and Starcraft Ghost, and what makes sense with a guy sitting in the cockpit (see attachment), my Goliath is about 15 feet tall, standing up straight. ...and the Zealot and the Goliath do match up fairly well with that SC1 render. Last edited by Robear; 10-10-2011 at 01:25 PM. ...my link to the Force has been disturbed.